The Betty Foy Sanders Department of Art will host several events this month featuring two acclaimed professional artists, Manuel Lima and Yoko Sekino-Bové. Renowned author and information design specialistManuel Lima will visit Georgia Southern on Oct. 13 at 5 p.m. in Visual Arts Building, Room 2071, as part of the Betty Foy Sanders Department of Art’s Professions in Practice lecture series. Billed “a digital designer and information guru” by New Scientist magazine and the “man who turns data into art” by WIRED magazine, Lima is an award-winning designer and author. His books,Visual Complexity: Mapping Patterns of Information and The Book of Trees: Visualizing Branches of Knowledge, explore the many creative ways designers, artists and historians are able to present complex information effectively — engaging audiences ranging from the everyday to the specialized. Lima is considered one of the leading voices on information visualization and has spoken at venues such as TED, Lift, OFFF, Harvard, MIT, NYU Tisch School of the Arts and many others. In addition, nationally respected potter, Yoko Sekino-Bové, will be an artist-in-residence at the Betty Foy Sanders Department of Art from Oct. 3 – 21. The community can meet Sekino-Bové during Conversations Over Tea on Oct. 17 from 2:30 to 5 p.m. at the Center for Art and Theatre at Georgia Southern. The artist also will present a public lecture on Oct. 18 from 5 to 7 p.m. in Visual Arts Building, Room 2071. Sekino-Bové is a Japanese-American artist whose ornate ceramic artwork blends her Japanese upbringing with her experiences living and working in the United States. Her work has been exhibited in both commercial and educational galleries across the U.S. as well as South Korea, Canada, Turkey and the Dominican Republic. Sekino-Bové will work alongside art students for three weeks, teaching and creating works in the studio. Her extended visit allows students an opportunity to advance, share and transfer skills and ideas under the guidance of another artist of national stature. “Her visit will develop the imagination through multicultural and interdisciplinary art making while also providing an additional example of what is expected of a working artist in the field,” said Schmuki. 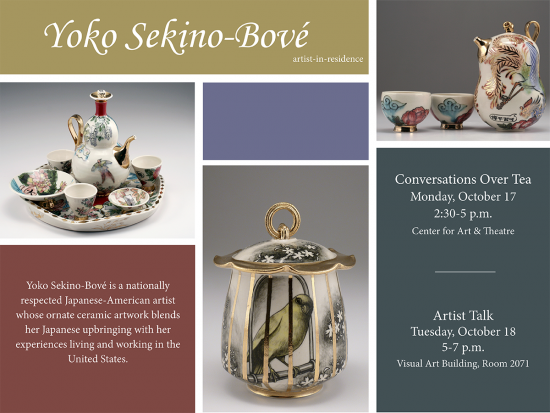 During Conversations Over Tea, guests will have an opportunity to see and use vessels created by advanced ceramics students under Sekino-Bové’s instruction. The experience aims to expand the audience’s notions of how art can be used to create discourse and civic action outside of traditional formats such as an art museum or gallery. Seiko-Bové’s visit is generously funded by the College Life Enrichment Committee and the Betty Foy Sanders Department of Art. All events are free and the public is invited to attend.